Don’t you just love it when a plan comes together? Ever since the floating Good Hotel arrived in London in autumn 2016, we’ve been waiting for the right brief to come along which would lead us there. Formerly a floating Dutch prison, this stylish, charmingly industrial property made its way over from Amsterdam (all 8 million kilos of it) and now sits in the Royal Victoria Docks offering views over the River Thames and the city of London. It also has a social mission, as its profits go towards training and providing jobs for long-term unemployed people in the local area of Newham. 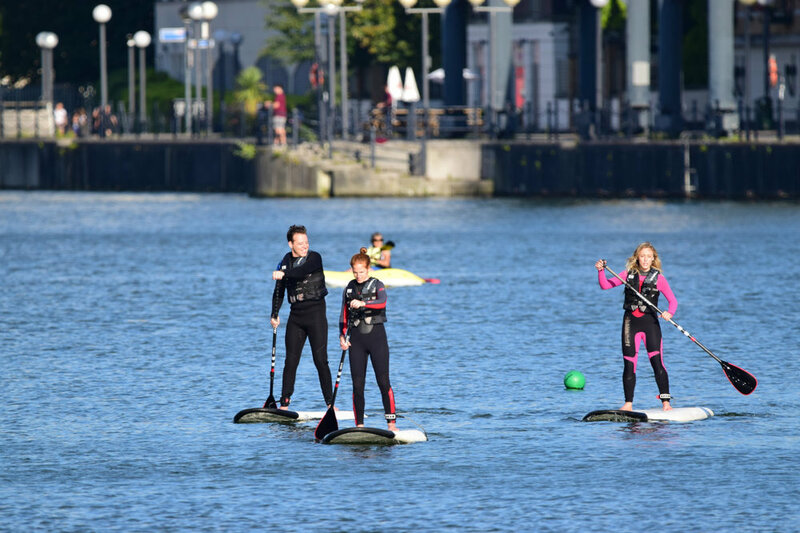 If that wasn’t temptation enough, the Royal Victoria Dock is also home to a whole host of water sports, from open water swimming to sailing. 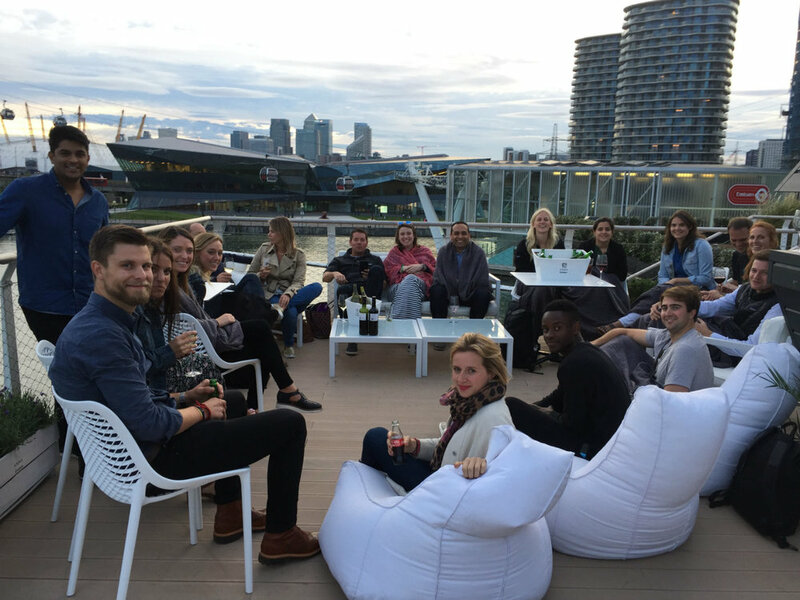 So, when Yext asked us to help them organise an internal summer event, we jumped at the chance to take them there. We made getting there part of the afternoon’s adventures, with a trip on the Thames Clipper from Embankment Pier to North Greenwich, followed by a scenic flight on the Emirates Air-Line cable car. 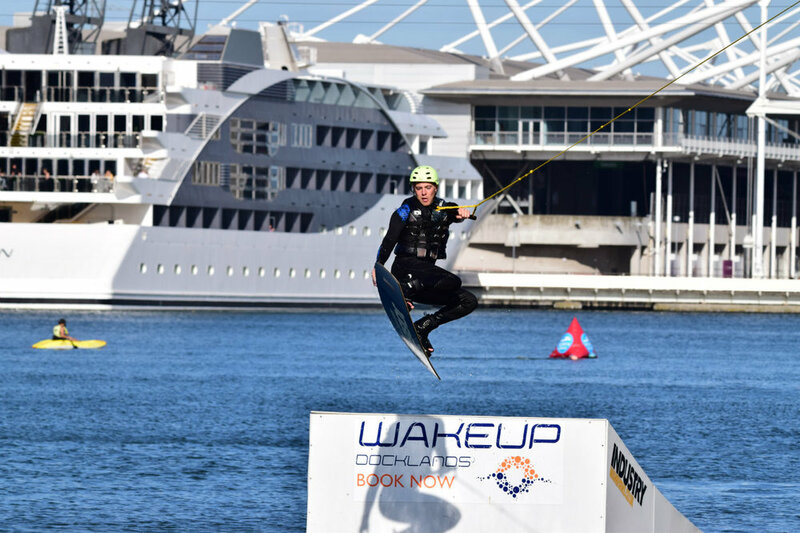 Once at the docks, the team donned wetsuits before trying their hand at cable wakeboarding and stand up paddleboarding, under the tutorage of the delightfuly laid back team at Wakeup Docklands. By a stroke of luck, we managed to pick the hottest day in August, so it wasn’t much of a challenge persuading the group to take the plunge. Those that didn’t fancy getting wet swapped wetsuits for warrior poses, and took part in yoga at Royal Victoria’s urban beach. We rounded off the day with canapes and cava in the Living Room back at the Good Hotel, before heading up to the newly opened Ibiza-lounge-style terrace, to take in the sun set. Here are some of our favourite photos, courtesy of Watersports Images. Follow our work and where we're finding inspiration on events, tech, London and everything in between.